The Cheyenne East High Thunderbolt is the student-run newspaper of Cheyenne East High School and is the recipient of multiple Golden Pony Awards from the Wyoming High School Student Press Association. The print-edition Thunderbolt is published throughout the school year and is distributed free to students, faculty, staff, and the public. The on-line edition Thunderbolt is continually updated and is accessible through the world wide web at www.ehsthunderbolt.com. The purpose of the school newspaper is to inform and entertain the student body, faculty, the local community, and other schools’ journalism programs on subjects that may affect readers. The Thunderbolt also aims to be a forum for student voices. The newspaper serves as a hands-on learning tool for the student staff. Staff members accept and promote the responsibility of publishing information in a clear, meaningful and journalistic way. The content decision-making process is determined by the Editorial Board, with the cooperation of the advisor. The Editorial Board includes the editor-in chief, business/advertising editors, photography editor and section editors. The Editorial Board shall meet and vote on a regular basis to establish content and deadlines. Meetings will be as needed. The advisor is there not to vote but to give comments and concerns prior to voting. If a controversial issue arises, it will be voted on in the same manner, but it is the common assumption that there will be nothing published in the newspaper that is libelous, obscene to minors, advocates illegal activities, is copyrighted, or may cause substantial disruption to the school. 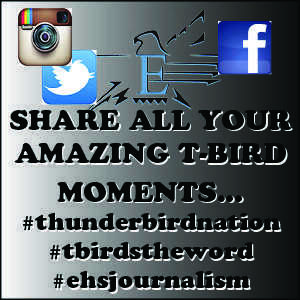 The Thunderbolt is published by Cheyenne East High School, a public institution. Student journalists are responsible for providing original content. The Thunderbolt accepts and publishes articles, photos, and information from other sources, but provides original author credit. EHS and the school district provide the majority of funding, but the staff is also expected to raise money for productions through the sale of advertising and funding-raising events. The Thunderbolt reserves the right to refuse advertising that the staff, school or advisor determines is false or misleading to the student body. No ads will be printed that promote products or services that do not meet community standards for good taste or that are illegal to the majority of the student audience. The Thunderbolt is committed to balanced and impartial news coverage. The reporters will attempt to represent all the sides of issues, even if they are controversial, in a fair and honest manner, avoiding exploitation and sensationalism. Emphasis is on issues related to the school, district and local issues, but state, national and international topics may be covered, if appropriate, and with a local angle. The Thunderbolt provides a public forum for free speech for students, staff members and others in the school community to voice opinions and concerns. The Constitutional right of free speech includes both the freedom and responsibility to discuss, question, challenge the institution, and the right to express unpopular opinions. The discussion and direction of the content of editorials will be by the Editorial Board, and those who do not agree may write dissenting staff opinions if appropriate. The newspaper staff welcomes letters from students, faculty, and community members as they offer a constructive way for more people to express their opinions, criticisms, and reactions to school issues. Submissions are accepted in Room 303 or by email at [email protected] Submitted work must be of reasonable length and signed by the author. The Thunderbolt does not accept nor publish anonymous letters or editorials. The Editorial Board and/or advisor will verify that a valid name is listed. If a letter has more than two people represented in the writing, there will be a main author credited. The letters must be 250 words or less, and can be edited for grammar and content if necessary. Due to limitations of space, the Thunderbolt staff will not guarantee all letters will be published. Logos and graphics used on the site must be consistent with the branding standards and usage guidelines of the School; sites that accept comments or postings by anyone other than the site administrator must be diligently monitored to ensure that information displayed fits within East High guidelines and is appropriate to the subject matter of the page; unauthorized pages that have not been approved by the Principal and Editorial Board will be treated as personal pages; all social media sites will be password protected and the passwords will be on file with the sponsor/advisor, the principal, and other concerned school officials. First and foremost, students are encouraged to always exercise the utmost caution when participating in any form of social media or online communications, both within the EHS community and beyond. Students who participate in online interactions must remember that their posts reflect on the entire East High School community and, as such, are subject to the same behavioral standards set forth in the LCSD1 Code of Conduct. To protect the privacy of EHS students and faculty, students may not, under any circumstances, create digital video recordings of EHS community members either on-campus or at off-campus EHS events for online publication or distribution without prior approval from the Principal or class sponsor/advisor. Students may not use social media sites to publish disparaging or harassing remarks about EHS, its community members, sponsors, teams, athletic or academic contest rivals, etc. 8. Illustrations, photographs, graphics, etc. Artwork represents the interpretations of the artist, not necessarily of the staff or EHS. Concerns about errors in the school media may be submitted though the adviser at 307 771-2663 or [email protected] The Editorial Board retains the right to determine whether, in fact, an error has been made. Known and/or found errors that are brought to the attention of the Thunderbolt staff will be addressed regardless if realized by author, audience, or staff member. Staff members will strive to correct errors prior to publication; however, if the Editorial Board determines a significant error is printed, the editorial board will determine the manner and timeliness of a correction. Major corrections are determined by the editors and adviser. If changes are made to a web story once a story has been posted, the change will be noted along with the date and time the change was made. The Thunderbolt will not print material that is libelous, obscene, indecent, profane, invades privacy, or disrupts the school process. The intent of the editorial board, advisor, and school administration is to protect and promote the First Amendment. The Editorial Board, advisor, or school may have valid reasons to restrict student speech in the name of academic integrity, but such rationale must outbalance the widely-held benefits of free speech. Questions or comments to these policies should be directed to the advisor at [email protected] or 307 771-2663.